Make ClickUp completely customized! Custom fields let you use ClickUp for virtually anything you can imagine. Track, sort, and filter work according to your team’s needs. You can display any Field(s) you like in List, Board, and Time views. Learn more about the differences in our plans. Gain insight into how your fields are being used with reports! You can group results by user, task, and even sort and filter your results for customized viewing. 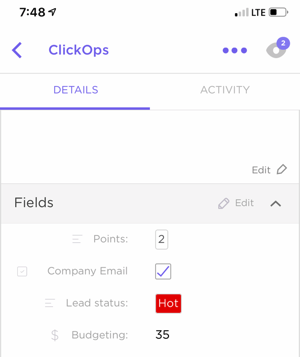 Take advantage of custom fields on iOS, so you can keep working on the go! What could we improve upon? Let us know here!